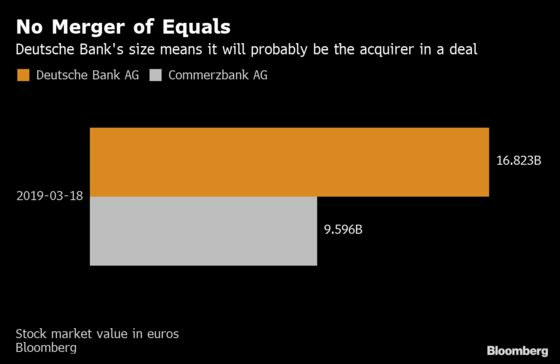 (Bloomberg) -- Deutsche Bank AG and Commerzbank AG are now getting down to the finer details of just how a takeover could actually work. With talks expected to last at least four weeks, there’s a mountain of thorny detail to work through. Cost cuts -- and where to make them -- and balance sheet risks are set to take a central role, people with knowledge of the matter said, asking not to be identified because talks are private. The potential for savings, or massive cuts, could be significant because the two firms compete in the same markets, have their headquarters in Frankfurt and a large presence in Germany. Goldman Sachs Group Inc. said in a report in October that similar deals in the past have been able to slash the target’s cost base by as much as 39 percent. Savings of that magnitude may also be achievable for Deutsche Bank and Commerzbank, people close to the talks said. As many as 30,000 jobs will all be up for discussion. Other options include overlapping branches, as well as call and processing centers. Commerzbank has been pulling back its markets business, recently selling its market-making unit to Societe Generale. There’s usually no such thing as a mergers of equals, and as the bigger of the two, Deutsche Bank is expected to be the dominant force in a deal, one person close to the talks said. Another scenario would be the creation of a completely new entity that would combine both banks or at least parts of it, another person said. Previous talks between the two in 2016 envisaged Commerzbank merging with Deutsche Bank’s German retail unit, according to a person involved at the time. Commerzbank has large holdings of Italian bonds, which may need to be revalued. On the other hand, Deutsche Bank’s U.S. political exposure and the future of its trading unit will be tough questions, too, one person said. Then there’s the question of goodwill -- or the amount the acquirer is willing to overpay to make a deal happen. Typically, that’s an expense, but the banks have the lowest share prices relative to their book values among large European peers. 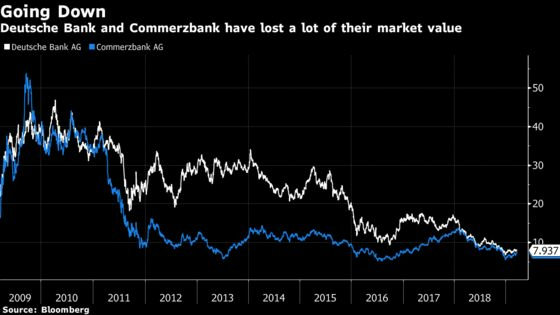 If Commerzbank were bought below its book value, that could lift Deutsche Bank’s capital, according to Goldman. The banks would probably need several billion euros to pay for the restructuring and revaluations -- either by issuing new shares or selling assets. That could lead Deutsche Bank to consider divesting asset manager DWS Group, though the bank is reluctant to do so, according to two people. Commerzbank could look at business such as internet retail bank comdirect, its Polish subsidiary mBank or its leasing business Commerz Real, said one person. No such action has yet been taken and it’s not clear the bank will, said another person. It’s too early to answer that question, people familiar with the matter said. But one person close to the talks said that, with Deutsche Bank the potential acquirer, a possible scenario would be for Chief Executive Officer Christian Sewing to keep his CEO role. 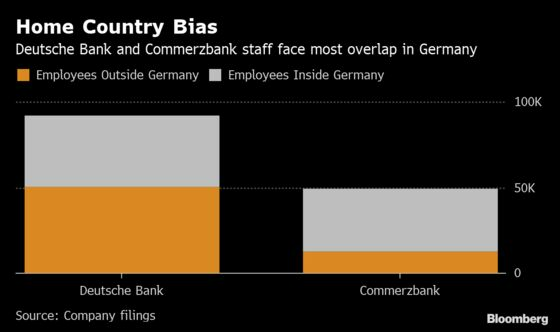 That would leave the question about the futures of Commerzbank’s management, led by CEO Martin Zielke, who has arguably had more success than Deutsche Bank with his restructuring. Officials for the banks declined to comment.